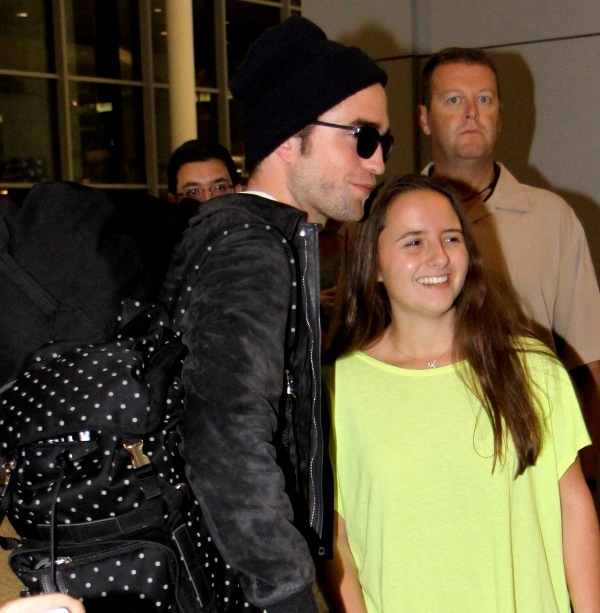 This could be the lullaby Twi-Hards (perhaps these two who are all over him at the airport in Toronto) have been going to sleep listening to since Kristen Stewart and Robert Pattinson broke up. There is always hope, right? The Toronto Star has published photos of Pattinson out with his Map To The Stars co-star Mia Wasikowska last night and there’s a girl kissing him goodbye. So now she’s now #1 on the Twi-Hard Kill List. Followed closely by Jesse Eisenberg. Because he’s supposed to be Kristen’s friend. And how could he betray her like this? It’s OK. Kristen Stewart is OK. She’s working. And, you know, it’s probably better this way. Better not to have to be target of such derangement. This will follow him for a long time, this attack on the women he loves by the fans who love him. It’s a lot of pressure for a girl to take on. And you don’t even get a royal title out of it.